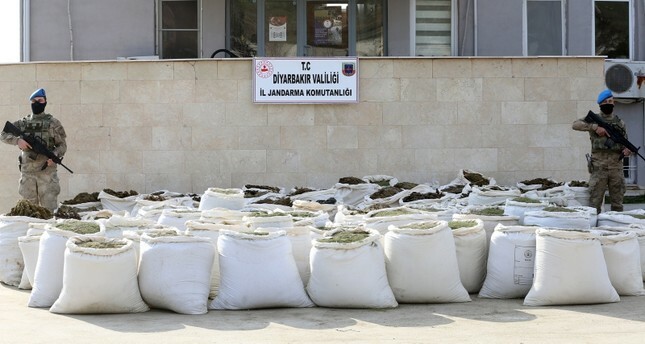 Turkish security forces confiscated five tons and 209 kilograms of hashish in an anti-narcotics operation against the PKK terror group in southeastern Turkey's Diyarbakır province, the local governor's office said Wednesday. The operation was previously made public by Interior Minister Süleyman Soylu on Tuesday as police units also seized two tons of cannabis in Istanbul. In a statement, the Diyarbakır Governor's Office said gendarmerie units, village guards and police special operation teams carried out the operation in the Lice district of Diyarbakır on Feb. 12. Security units seized five tons and 209 kilograms of hashish in bins and sacks buried in the ground at ten different points in the rural areas of the district. According to the governorship, various weapons and ammunition were also seized during the operation and several shelters used by the terrorists were discovered by security forces. A hand-made explosive device consisting of a 12-kilogram gas cylinder planted by the terrorists on the road to Lice's Yolçatı village was diffused by bomb disposal units. A Turkish police report released on Sept. 26 2018 revealed that the PKK terrorist organization is active in all the phases of drug trafficking, including the production, delivery, distribution, and sales. The terror group reportedly produces heroin in laboratories in its camps in northern Iraq and sells it to Europe. In its production process, the PKK terrorist organization forces civilians to produce cannabis roots in the eastern and southeastern provinces of Turkey and uses that money to fund terror activities. The terror group earns $1.5 billion from drug trafficking annually, according to the 2018 Turkish National Drug Report that contains data from the previous year.